Ennai kathirikkai kuzhambu is an authentic and tasty side dish to hot rice. It is our favorite dish and it is preferred for rice only in our villages. Once you taste it you never forget the flavor and its wonderful taste. 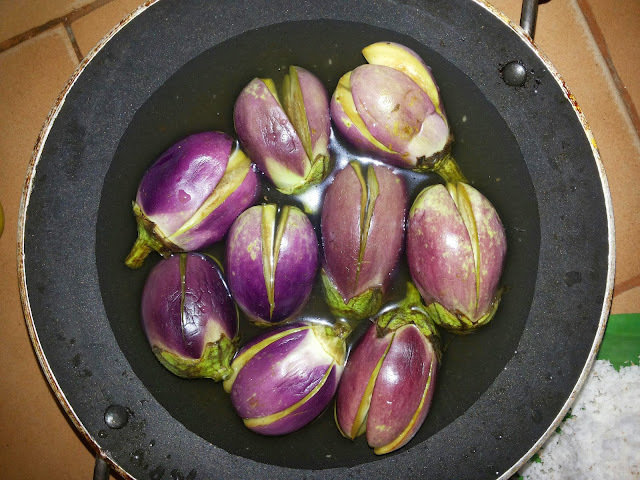 Wash the baby brinjals with calyx and cut into four parts and the part of calyx is intact. Heat the oil in a pan and add red chillies, coriander seeds, cumin seeds, cloves three, cinnamon two or three, onions, curry leaves, garlic pulses one by one.